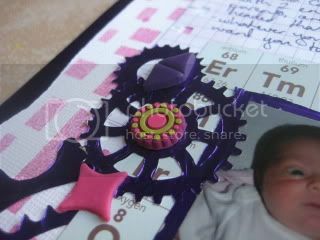 The challenge over at Scrap The Boys this month is to use handmade embellishments - this is right up my ally!! I've used a mix of handmade embellishments from Purple Pumpkin (the cute monkey button and one of the cogs) and My Vintage Blossoms (one of the cogs and the hessian ribbon). 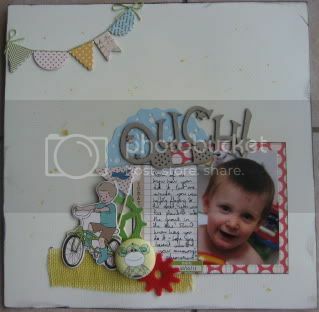 The PP and chipboard embellishments are from the new October Afternoon 'sidewalks' range - cute huh!! I've really enjoyed the Passion 4 Fashion competition that i've been a part of over at Scrapboutique over the past 8 weeks - and it's hard to believe that this week is the last week!!! 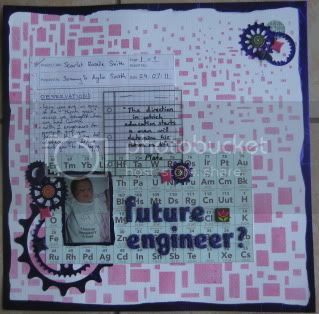 The theme for this week was futuristic - so i went with some purple foil and the geometric shapes of this crafters workshop template. The cogs are a new spellbinders die i got recently and it's the first time i've used it - and i LOVE it :D I've used lots of my Olive Roses on this one, along with some old jellishments! Great layouts Kylie. 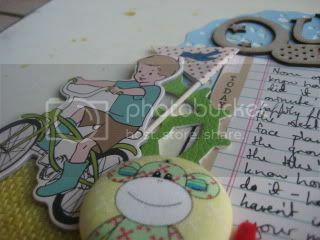 Love the little Pumpkin Patch monkey button too! Well done. 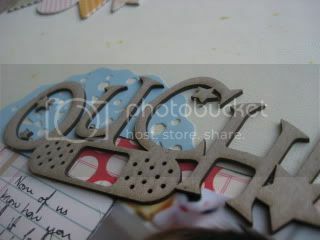 That 'Ouch' chipboard is so cute!! Great layout!